1. a rigid or flexible appliance for fixation of displaced or movable parts; see also orthosis. 2. to supply support for the purpose of immobilizing an injured or displaced body part. Uses. Splints are most commonly used to immobilize broken bones or dislocated joints. When a broken bone has been properly set, a splint permits complete rest at the site of the fracture and thus allows natural healing to take place with the bone in the proper position. Splints are also necessary to immobilize unset fractures when a patient is moved after an accident; they prevent motion of the fractured bone, which might cause greater damage. In a pelvic or spinal fracture, the effect of splinting is achieved by placing the patient on a stretcher or board. Breaks of the ribs and of face and skull bones usually do not require the use of splints, since these parts are naturally splinted by adjacent bone and tissue. Making and Applying Splints. A splint can be improvised from a variety of materials, but should usually be light, straight, and rigid. It should be long enough to extend beyond the joint above the injury and below the fracture site. A board used as a splint should be at least as wide as the injured part. Tightly rolled newspapers or magazines can be used to splint the arm or lower leg. Ice cream sticks have been used as splints for broken fingers. Splints should be padded, at least on one side. Thick soft padding permits the injured part to swell and reduces interference with circulation. Bandages or strips of cloth or adhesive tape are used to hold splints in place. Pulses distal to the injury should be checked before and after splinting to determine whether the blood supply has been impaired. If the limb becomes cold, pale, or blue, or if the affected part becomes too painful, the splint should be loosened. Splints should never be tight. Internal Splints. Internal splints, as well as pins, wires, and other devices for the fixation of fractures, are among the more spectacular advances in orthopedics. They have worked wonders in the setting of hip fractures, especially in older people. Internal splints are available for almost every type of fracture. Stainless steel, titanium, and Vitallium are the most commonly used materials. Splints and devices of this type require surgery for insertion, but are less cumbersome than external splints and permit earlier use of the fractured bone. Types of splints. From Lammon et al., 1996.
airplane splint one that holds the splinted limb suspended in the air. anchor splint one for fracture of the jaw, with metal loops fitting over the teeth and held together by a rod. coaptation s's small splints adjusted about a fractured limb to produce coaptation of fragments. Denis Browne splint a splint for the correction of clubfoot, consisting of two metal footplates connected by a crossbar. dynamic splint a supportive or protective apparatus that aids in initiation and performance of motion by the supported or adjacent parts. shin s's strain of the long flexor muscle of the toes, occurring in athletes and marked by pain along the tibia. Taylor splint a horizontal pelvic band and long lateral posterior bars; used to apply traction to the lower limb. tenodesis splint an orthosis that allows pinch and grasp movements through the wrist extensors. Thomas splint two iron rods joined at the upper end by an oval iron ring or half-ring, and bent at the lower end to form a W shape; used to give support to the lower limb and remove the weight of the body from the knee joint by transferring it to the pelvis. 1. An appliance for preventing movement of a joint or for the fixation of displaced or movable parts. 2. The splint bone, or fibula. 3. splint bone; in veterinary anatomy, refers to the vestigial second and fourth metacarpal and metatarsal bones of horses that are closely apposed to the third metacarpal or metatarsal by a periosteum anchor. 4. In equine medicine, the term applied to the hard swelling (soft tissue inflammation and exostosis) produced by trauma or stress affecting the periosteal junction of the splint bone at the junction with the second metacarpal/metatarsal, causing localized inflammation, swelling, heat and pain; usually affects forelimb and almost always affects junction of the second and third metacarpal. Classified as high splint when proximad and low splint when present on the distal aspect of the splint bone. 1. a rigid or flexible appliance for fixation of displaced or movable parts. 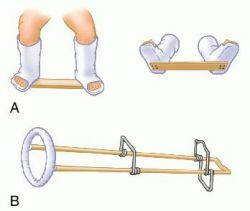 Splints: (A), Denis Browne splint; (B), Thomas knee splint. 2. the act of fastening or confining with such an appliance. airplane splint one which holds the splinted limb suspended in the air. Angle's splint one for fracture of the mandible. Balkan splint see under frame. coaptation splints small splints adjusted about a fractured limb for the purpose of producing coaptation of fragments. Denis Browne splint a splint consisting of a pair of metal foot splints joined by a cross bar; used in talipes equinovarus. dynamic splint a supportive or protective apparatus which aids in initiation and performance of motion by the supported or adjacent parts. shin splints strain of the flexor digitorum longus muscle occurring in athletes, marked by pain along the shin bone. Thomas splint a leg splint consisting of two rigid rods attached to an ovoid ring that fits around the thigh; it can be combined with other apparatus to provide traction. a. A rigid device used to prevent motion of a joint or of the ends of a fractured bone. b. A dental appliance put on the teeth to protect them from grinding or from moving out of place. 2. A bony enlargement of the cannon bone or splint bone of a horse. To support or restrict with or as if with a splint. 1 an orthopedic device for immobilization, restraint, or support of any part of the body. It may be rigid (made of metal, plaster, or wood) or flexible (made of felt or leather). 2 a device, usually made of hard acrylic and wire, for anchoring the teeth or modifying the bite. Compare brace, cast. 1. An appliance used to prevent movement of a joint or to fixate displaced or movable parts. A splint used in fractures of the patella and metacarpus. Because of the tendency for the air cast to straighten out the limb as it is inflated, this device should not be used to immobilize joint dislocations or fractures with gross displacement. An appliance usually used on ambulatory patients in the treatment of fractures of the humerus. It takes its name from the elevated position in which it holds the arm suspended away from the body. A splint for fracture of the jaw, with metal loops fitting over the teeth and held together by a rod. A splint used for continuous extension in a fracture of the femur. A splint made out of a steel rod bent to resemble the shape of a banjo. It provides anchor points for attachments to the fingers in the treatment of contractures and fractures of the fingers. An obsolete dressing in which plaster was applied between two layers of flannel. A splint used for fracture of the lower end of the radius. A splint used for fracture below the knee. A splint made up of two pieces of metal or wood united by brackets. A splint composed of a metal structure placed posterior to the thigh and leg. A steel bridge with wings connected by a hinge, used for operation of a depressed nasal bridge. A small splint adjusted about a fractured part to prevent overriding of the fragments of bones. It is usually covered by a longer splint for fixation of entire section. A static splint to maintain the wrist in either extension or flexion. A splint constructed around an injured bone to reduce the potential for flexion contractures. A splint to treat talipes equinovarus (clubfoot), consisting of a curved bar attached to the soles of a pair of high-topped shoes. It is often used in late infancy and applied at bedtime. Its use generally follows casting and manipulation to reduce the deformity. A splint constructed on the back of the hand to inhibit full extension of one or more of the finger joints and/or the wrist. A padded strip of malleable metal or plastic used to immobilize a fractured finger. As an alternative, the injured finger is often “buddy taped” to an adjoining finger for support. An upper-extremity orthotic device to provide support and limited function, consisting of a shoulder-operated harness, a volar supporting structure made of low-temperature thermoplastic material, and a terminal device that allows the arm to grasp or stabilize objects. A splint formerly used for a fractured clavicle. A splint that is a modification of a Thomas splint. A side splint used for the arm and hand in a Colles fracture. A rigid or flexible device or compound used to support, protect, or immobilize teeth that have been loosened, replanted, fractured, or subjected to surgical procedures. A splint used for the fracture of nasal bones. A splint of perforated metal extending from below the elbow to the end of the palm, shaped to fit the arm and hand. A device to maintain an open airway in patients who suffer partial upper airway collapse during sleep. The splint is placed in the mouth at bedtime. A splint shaped like a double inclined plane, used as a posterior splint for the leg and thigh. A splint fashioned to cover the incisal and occlusal surfaces of a dental arch to stabilize the teeth, treat bruxism, or facilitate proper occlusal positioning. A splint designed to maintain the thumb in a position to oppose the other fingers. A splint of wood, typically padded on one side and covered with plastic or cloth, to which an injured extremity can be fastened to immobilize it. A nonremovable splint firmly attached to an abutment used to stabilize or immobilize teeth. A fixed bridge may serve as a permanent fixed splint for such support. A splint designed to position the fingers and stabilize the hand in a functional position with the fingers held in opposition. Any orthosis that lacks movable parts and is used for positioning, stability, protection, or support. A splint commonly used instead of a cast to immobilize a Colles fracture after it has been reduced. The splint permits the affected arm to swell without being compressed within the confines of the cast yet maintain its alignment. Follow-up diagnostic images of the fracture are typically obtained 5 to 7 days after placement of the splint to ensure that adequate reduction of the fracture is maintained. Any of a variety of splints used for temporary or intermittent support and stabilization of the teeth. A splint fabricated to allow pinch and grasp movements through use of wrist extensors. A splint that provides continual traction to a midshaft lower extremity fracture. A negative-pressure splint to immobilize the extremities or torso after an injury. It may be used to safely transport the injured person. The splint consists of a nylon appliance filled with Styrofoam-like beads. The appliance is fitted around the injured body part and air is removed using a vacuum pump. As air is removed, the appliance conforms to the body part without straightening the limb. Distal neurovascular function must be monitored after splint application. If decreased circulation or neurological involvement is noted, the splint must be loosened immediately. A usually temporary support or reinforcement for an injured part, often used to minimize movement at the site of injury, especially in the case of a fracture of a bone. A thin piece of rigid material that is sometimes used during nasal surgery to hold certain structures in place until healing is underway. 1. An appliance for preventing movement of a joint or fixation of displaced or movable parts. n 1. a rigid appliance for the fixation of displaced or movable parts. 2. a support or brace used to fasten or confine. 3. metal, acrylic resin, or modeling compound fashioned to retain in position teeth that may have been replanted or have fractured roots. n adjacent tooth restorations that have been rigidly united at their proximal contact areas to form a single abutment with multiple roots. n an appliance, usually fabricated of resin, designed to cover the occlusal and incisal surfaces of the teeth to immobilize and stabilize the teeth and thus prevent them from being subjected to the effects of trauma from occlusal forces. n a material such as plaster that can be placed on the buccal surfaces of assembled fixed partial denture units and onto which these components can be assembled and held in accurate relation after hardening. n a plastic or metallic fracture appliance designed to cover the crowns of the teeth; usually held in place by cementation. n a cast splint used for the provisional immobilization of teeth. n a splint fabricated from copper bands and acrylic resin. n an appliance used for temporary tooth stabilization; constructed of gold, acrylic resin, chrome-cobalt alloys, or combinations thereof. It consists of a continuous crib clasp covering the facial and lingual surfaces of the teeth to be splinted. n a splint formed by a metal bar that unites one or more teeth of one side of the dental arch to one or more teeth of the opposite side. Used to stabilize weakened teeth against lateral tilting forces. See also connector, cross arch bar splint. n.pr a type of cross arch bar splint. n an implement designed to hold teeth in place. It may be temporary or permanent. n a splint used to hold condyles forward in order to correct condyle-disk alignment. n a fixed (nonremovable) restorative and replacement prosthesis used as a therapeutic aid in the treatment of periodontal disease. It serves to stabilize and immobilize the teeth and replace missing teeth. n.pr See splint, cast bar. n an inlay casting designed to give fixation or support to one or more approximating teeth. This may be accomplished by two inlays soldered together or a single casting made for prepared cavities. n an appliance made of plastic or metallic materials that is applied to the labial and lingual aspects of the teeth to provide points for applying mandibular and maxillofacial traction and fixation. n an appliance of plastic, metal, or combinations of plastic and metal made to conform to the labial aspect of the dental arch. Used in the management of mandibular and maxillofacial injuries. n an appliance similar to a labial splint but conforming to the lingual aspect of the dental arch. n a splint placed for a relatively short period. It is used to stabilize the teeth either during the healing period after accidental or deliberate tooth evulsion and replantation or in conjunction with periodontal therapy. It also may be used during a period of observation to determine the prognosis of the involved teeth. 1. a rigid or flexible appliance for fixation of displaced or fractured bones. an external mandibular splint used to stabilize fractures. It consists of fixation bolts placed in the mandible with an acrylic bar placed across the protruding ends, parallel to the mandible. one with a central channel into which the well padded limb is placed for support of a fracture. open reduction fracture repair based on placing Steinmann pins through the cortex and at an acute angle to the bone, in both sides of the fracture. The pins are connected to each other with rods which are then locked together with a Kirschner clamp, the fracture reduced and the pin-clamp assembly readjusted. Half-pin systems include Jonas and Kirschner. rigid splinting material such as plaster is applied to the lateral surface of a limb covered in a soft padded bandage to provide support and protection from angular or bending forces. aluminum rods, bent to conform to the angles of the limb, are incoorporated into the outer layers of a soft padded bandage to provide support and protection from angular or bending forces. similar to a lateral splint, but the bandaging and splinting is more extensive, being carried over the shoulder or hip and across the dorsal midline. Used to immobilize the humerus or femur, temporarily or as an adjunct to internal fixation. a traction splint, made of aluminum rods and consisting of a padded ring with extended bars bent to a shape determined by the size of animal and type of fracture. The limb is suspended and traction applied to the joints proximal and distal to the fracture site by wrapping with padded bandages. Modified versions are used for radial and tibial fractures in large animals. molded to fit the bottom of an avian foot, it is suitable for supporting fractures of the digits in those species. concave channel splints of metal or plastic, commonly used over soft padding for fractures of the lower limb in dogs and cats. the original half-pin splint now largely superseded by the kirschner splint. The pins have to be placed in the bone fragments in the position dictated by the configuration of the blocks into which the pins are fastened. support with tape can be used on leg fractures in birds. 03 inch silastic splint (BioPlexus, Ventura, CA), and was inserted only on one side, with the other side serving as a control. In general, in most of the unilateral crossbite may require maxillary expansion as the prime cause for mandibular shift would be transverse discrepancy between maxilla and mandible but in the above case report the patient had both lateral and anterior shift due to palatally placed 12, and it was evident after the alignment of the upper arch and removal of reflex releasing splint on the lower the crossbite was eliminated. 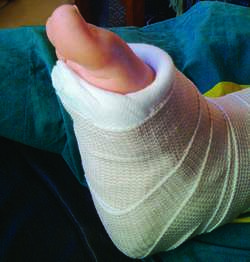 The edema size reduced to a significantly greater extent in the elastic bandage group than in the splint group. They took us to a hospital in Etaples and then put me in a bed and fitted me with a Thomas splint, a round wooden ring with iron bars and a footrest". Thousands of lives were saved during the war by advances in medical science; Polly Groom, from Cadw, pays tribute to Welsh orthopaedic surgeon Hugh Owen Thomas (1834-91) and his invention of the Thomas splint - a device that went on to save thousands of lives during and after WWI.. Participants were then subjected to an intervention protocol with a silicone splint modeled to their dentures for at least 12 hours/day during a 60-days period. The excess acrylic resin serves as setting indica- tor by which when the dough staged is reached the splint is carefully moved and vertically withdrawn and replaced several times to ensure smooth removal and insertion therefore to prevent splint locking and unwanted horizontal movement during lateral excursions. In a study of 110 patients, Malki et al found no significant difference in pain at 48 hours between patients who received a splint and those who did not. 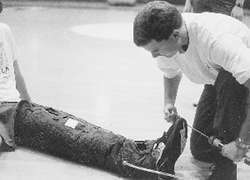 The splint had two components--Ventral component made up of low cost moldable plastic, polyvinyl chloride (PVC) which was cut after taking actual measurement by tracing the weight bearing hand with the thumb in abduction and the Dorsal component made from polythene which was cut in similar manner except that a part was trimmed by 1" to ensure for the wrist extension, padded with foam and harnessed with 1/2" Velero in loops and hoops. The baby was surgically fitted with a custom splint, which was printed based on a 3D model made from a CT scan of the baby's bronchi and trachea. Cantillon said: "It is incredibly unfortunate, but the worst thing would have been if one of his legs went, but as it turned out it is just a nasty splint. It's all to do with a splint that flared up earlier on and that's why we took out the earlier part of the season. Patients were placed into one of three initial types of immobilization: a sugar tong splint, a long arm cast, or a short arm volar splint. Re-displacement of extraphyseal distal radius fractures following initial reduction in skeletally immature patients: can it be prevented?